A very long time ago I used to earn a living writing database applications on PCs. One early project for a fleet transport system was won over competition from KPMG. I remember being pretty chuffed about that at the time. So I’ve always had a soft spot for database software. 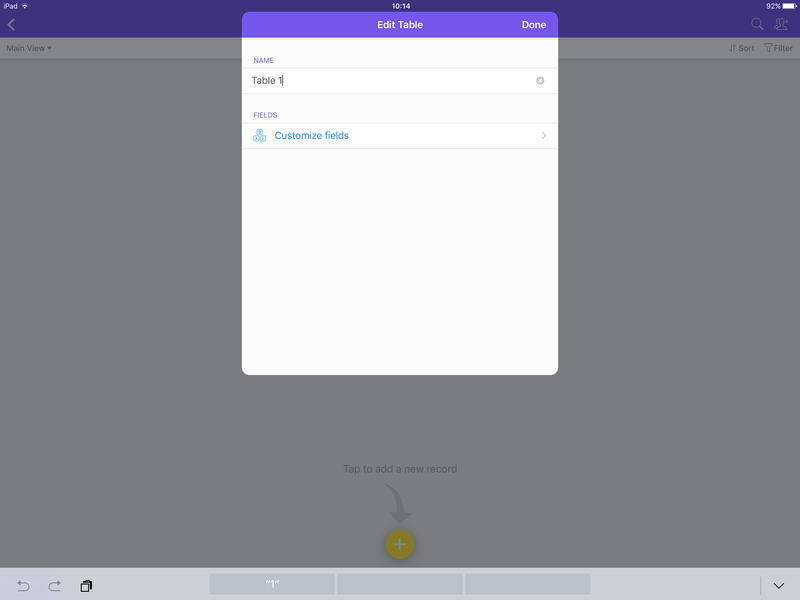 I first saw Airtable mentioned in a post by Federico Viticci on MacStories. When the iPad app version appeared, I decided to give it a try. 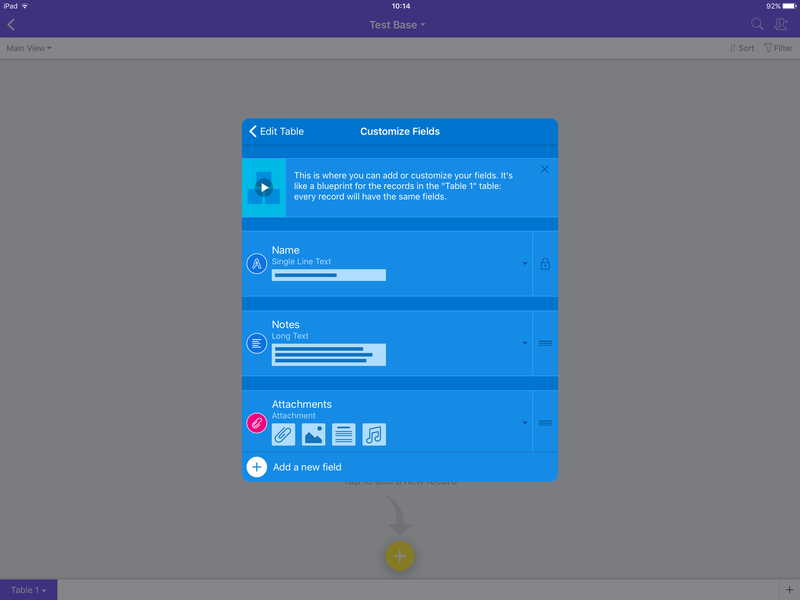 One of the first thing to note before getting to the nuts and bolts of using the app is that Airtable is cloud-based; you must create an account. There are several levels: the bottom tier is free. This allows an unlimited number of databases (Airtable just calls them bases) each with a maximum of 1200 records per database, and there is a limitation of 2 GB attachment storage. The higher levels cost $12 and $24 per month per user (with up to 50000 records per database for the latter). 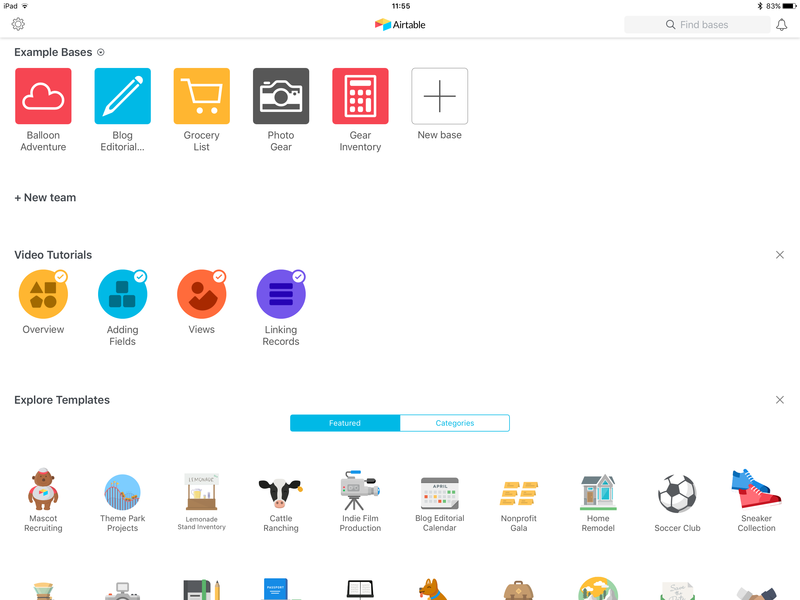 Airtable have announced an “enterprise” account, but the cost and details are not yet shown on the pricing page. I have not found any details on the infrastructure, but the info on the support pages indicates that 256-bit encryption is used to protect data during transit and when stored on Airtable’s servers. 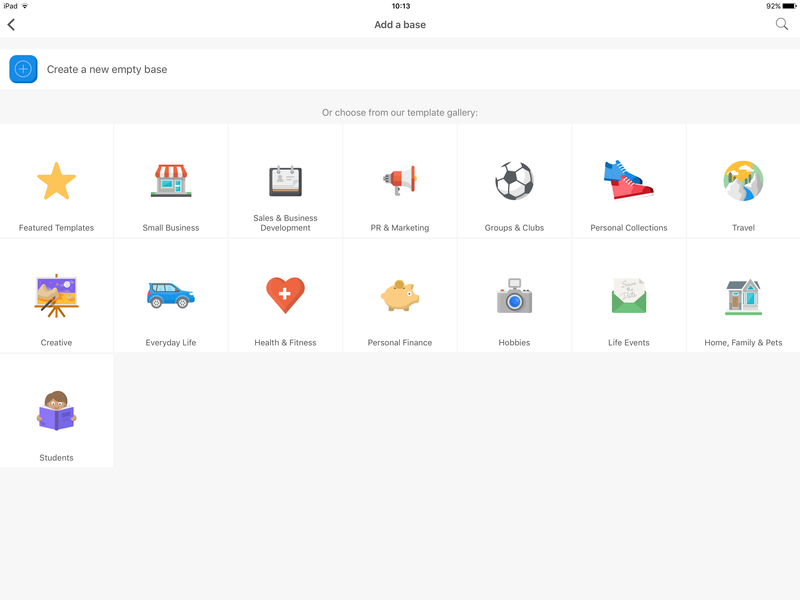 Airtable is available as a web app or an iOS app, and you have to be online to do any work. During the account set-up process, you are asked about specific database interests. The ones you choose are automatically added to your home page, but all the other templates are available to be copied and modified. I’m going to build a simple database for client management. I have not done a great deal of design and planning, so I might have to back-up and rework every now and then. Also I’ll work mainly on the iOS app, but there some things that can only be done using the web app (see section below). When you first set up Airtable, you’re asked to choose three database applications. These are then copied to the Airtable home page on your account. On this page, you can see the databases that have been copied from templates and any others that you have created. There are linked to the training videos and lots more templates disappearing off the bottom of the screen. When you create a new database, you are offered the choice of an empty base or copying one of the existing templates. Selecting the new Table 1 brings up the edit table screen that allows you to change the name and customise the fields. In addition, the web app allows the creation of formulas, rollups, counts, and lookup. Although these cannot be created in iOS, they still work correctly when accessing a table that contains these field types using the iOS app. In future posts, I will provide some more details on using Airtable as I create my example database. You can only create formulas, rollups, counts, and lookups from the web app. The results will still show on iOS. You can only create form views from the web app. Form views are not available in the iOS app. Grid view and summary bar is currently only available from the web app. You can only create public share links from the web app. Forms can be viewed and filled out in the browser on iOS devices. There are a number of articles and videos on the website. The iOS training videos are accessible from the opening screen in the app. The videos are all pretty short, dealing with one aspect of the product. They are helpful, but there is no commentary, just some really annoying music that just distracts from the content. Their overly effusive marketing/web page touts this tool as having the simplicity of a grid based spreadsheet coupled with the back-end power of a relational database. Their spreadsheet/database analogy, however, is severely compromised when one discovers that the IOS version, natively, can’t even add 2+2. We’re talking no formulas, no calculations, no functions — nothing. Now, as this site’s review has already made clear the desktop version of this tool can do all of the above. 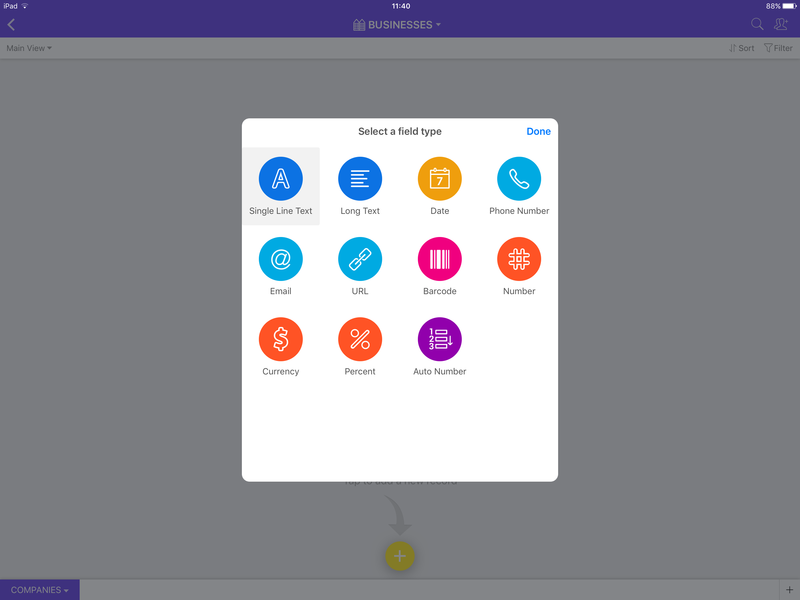 This makes Airtable a mixed bag for me. I stumbled across it quite by accident when searching for a solution on how to link records in Filemaker, a problem that one would think would be intuitively obvious, but was not. The prospect, then, of doing things more easily in Airtable with tables and records drew me in, but the reality of being tied to my desktop computer to accomplish the lion’s share of the tasks quickly soured my view.